Learn to cook smarter, save time and money, and enjoy great meals crafted from leftovers in this practical and creative cookbook that teaches you to plan and prepare great "second meals." When it comes to cooking and leftovers, James Beard Award-winner Sara Dickerman believes that there is nothing better than figuring out the right way to reframe a good meal into another, potentially great meal. Second meals aren't just reheating last night's dinner. For Sara, there's excitement in introducing new flavors and textures at the next meal-that eureka moment of fitting ingredients you have into a delicious new framework. In Secrets of Great Second Meals, she inspires use to create fresh, delicious meals using what's in those containers in the refrigerator. At Sara's house, re-invention might mean pureeing roasted vegetables into a quick soup, crafting a beautiful salad with some second-day salmon, or stuffing cooked rice into roasted poblano peppers. 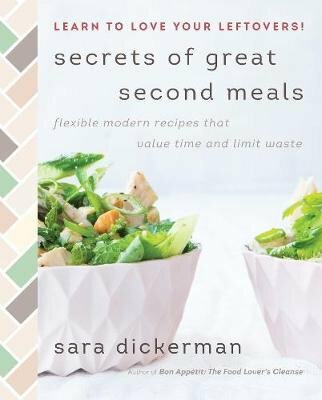 But unlike other cookbooks that emphasize thrift, Secrets of Great Second Meals focuses on creating inviting, sophisticated, and healthy recipes that are open-ended enough to adapt to what you have on hand. Sara shows how to make the most of your food the way chefs do: by thinking of meals in a more modular way. With a little thoughtful planning, you can look at extra food from one dinner as components to another meal that has already been prepped. Sara provides a list of the top ten most versatile dishes for multiple meals, offers advice on food storage (how to wrap it, when to put it in the fridge, when to freeze it, and when to throw it out), and includes tips on adding freshness and flavor using salt, acids, herbs, and texture. Most importantly, she gives home cooks the tools they need to learn how to improvise confidently. The recipes in Secret of Great Second Meals are meant to be flexible, and Sara gives home cooks plenty of cues on how they can be adapted to fit what in the fridge and pantry for dishes such as: The Frittata: Meatball Frittata with Mozzarella and Tomatoes (extra ingredient: meatballs) The Quinoa Bowl: Quinoa Bowl with Greens, Sweet Potatoes, and Turmeric Cream (extra ingredients: cooked quinoa, roasted sweet potatoes, and cooked greens) The Chicken Salad: Ginger-Scallion Chicken Salad with Cucumbers (extra ingredient: roasted chicken) The Chunky Chile-Laced Soup: Turkey-Vegetable Tortilla Soup (extra ingredients: shredded turkey or chicken and roasted vegetables) Deli Sandwich with a Twist: Hot Ham and Cheese with Dill Pickle Relish (extra ingredient: cooked ham) The Fish Cake: Black Cod Cakes with Cilantro, Scallions, and Tomato Salad (extra ingredients: cooked fish and cooked potatoes) The Pesto Pasta: Parsley and Celery Pesto with Whole Wheat Spaghetti, Sausage, and Broccoli (extra ingredients: cooked Italian sausage and broccoli) The Rice Pudding: Saffron Rice Pudding (extra ingredient: cooked rice) Illustrated with full-color photos throughout, Secrets of Great Second Meals makes re-imagining food for a second meal not just a good, cheap, un-wasteful thing to do, but way of making everyday eating more inventive and enticing.